Perched at the top of our 7×7 stainless steel wire rope range in terms of diameter, load capacity and overall strength, this 12mm 7×7 stainless steel wire rope product is just one of the many stainless steel ropes we supply. Packing a fully tested and assured working load limit of 8,942kg, this 12mm 7×7 stainless steel wire rope has a lot to offer in terms of practical performance potential. It can be used in lifting assemblies, as maritime rigging, as a sturdy balustrade or as a control cable in sewage systems. 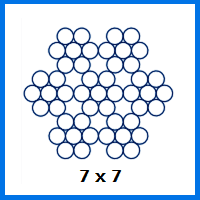 Such versatility is undoubtedly impressive, with the corrosion resistance of the stainless steel going hand in hand with the malleability of the 7×7 strand configuration. You trade a little strength to get this compared with our 1×19 rope, but the results are worthwhile. Since our rope assemblies can be made to order, there is no reason to take on the task of constructing the perfect assembly yourself. Rope Services Direct can turn this or any other wire rope into a form that fits your desired specifications. Of course if you do have the resources to take charge of the trickier aspects of construction yourself, you can still rely on us to supply wire rope fittings along with your order so that you are not missing anything vital. Want our advice on 12mm 7×7 stainless steel wire rope? You can get all the guidance you need when you email our team or give them a ring on 01384 78004. 12mm 7x7 Stainless Steel Wire Rope Overall rating: 5 out of 5 based on 6 reviews.